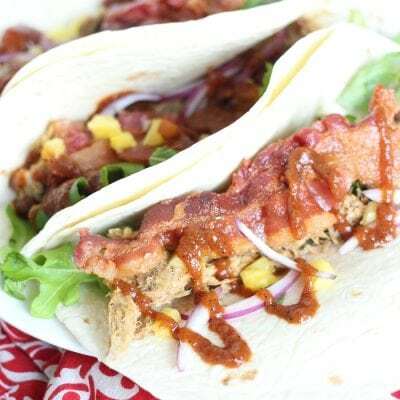 Pork Tacos are the perfect easy recipe for your next Taco Tuesday – add it to your simple meal planning recipe list today! Pork Tacos! Yaassssss! We’re kind of taco fiends around here. I can’t think of a time in the past decade that we haven’t had soft taco shells and a variety of fixings at the ready. Serve your pork tacos with Asian Slaw and Pickled Onions! Early on we played it safe with your basic taco seasoning and standard toppings, but in recent years we’ve been getting more and more adventurous. Okay, mostly it’s me. I mean my husband totally eats (and loves) the funky combinations I make (usually), but left to his own devices he would probably eat plain chicken breast six days out of seven. I love him, but there’s a good reason I do the food blogging. 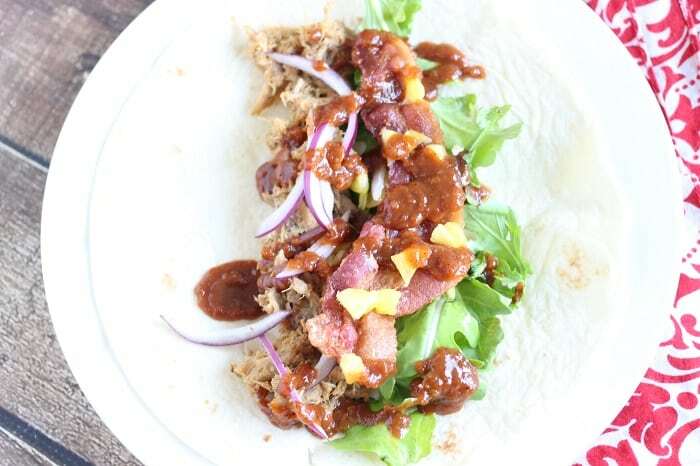 This Bacon Pineapple Pulled Pork Taco was inspired by Hawaiian pizza – and the leftover pork in my fridge that absolutely needed to be used. (Just keeping it real). Regardless of why I made it, we’re all pretty glad I did. Because, yummmmmmm. It’s really important that you put the ingredients down in the correct order so your tastebuds are properly sensitized. Haha. Not really. just toss them in – they taste good together, that’s why we’re stuffing it all into a taco! 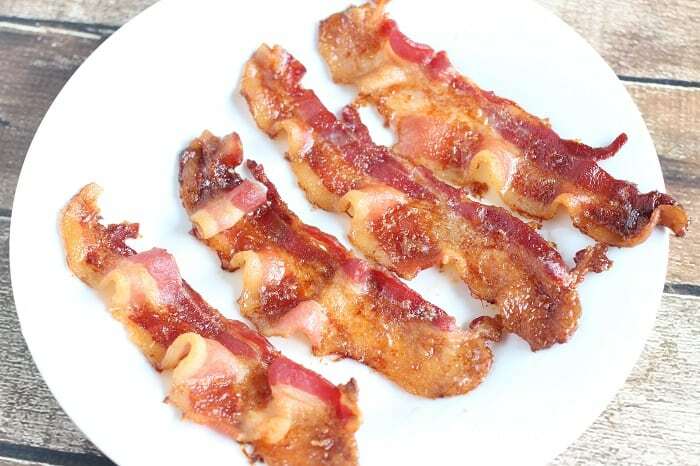 Baaaaacon. Mmmmmm. I very, very, very strongly suggest including one long well cooked slice of bacon to each taco as opposed to a handful of bacon crumbles. 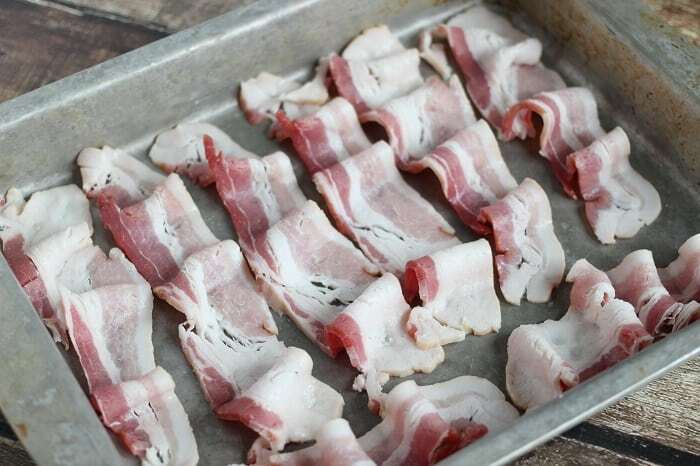 By doing this you give it great crunchy texture and ensure that every single bite along the way has some of that delicious bacon flavor. My girlfriend, Elaine, made me a really delicious home-made barbecue sauce, so that’s what I put on ours, but you can use whatever barbecue sauce you love! Canned pineapple will work in a pinch, but if you can swing the fresh stuff you’ll be glad you did. 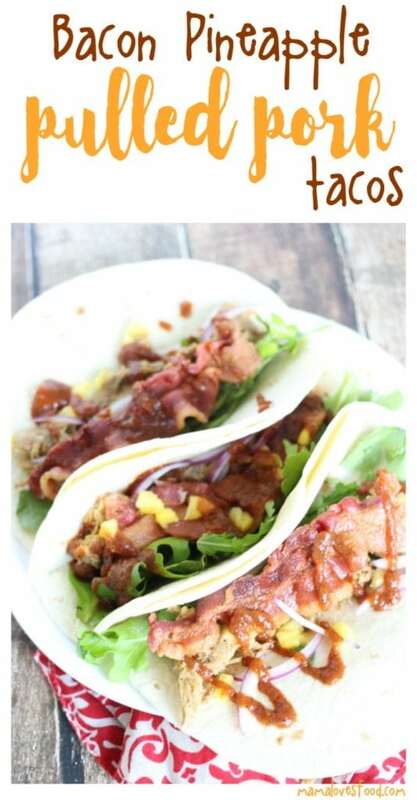 If you love TACOS be sure to check out these other awesome recipes! 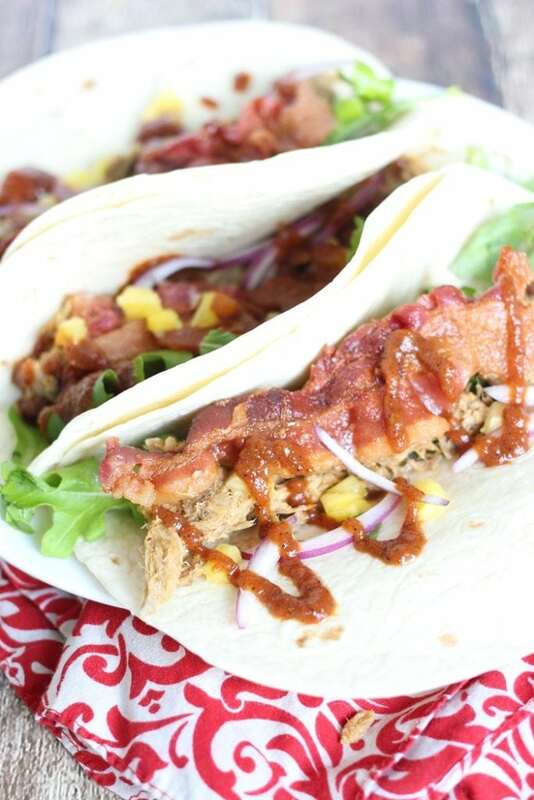 Pork Tacos are the perfect easy recipe for your next Taco Tuesday - add it to your simple meal planning recipe list today! Place ingredients into the tortillas and ENJOY! 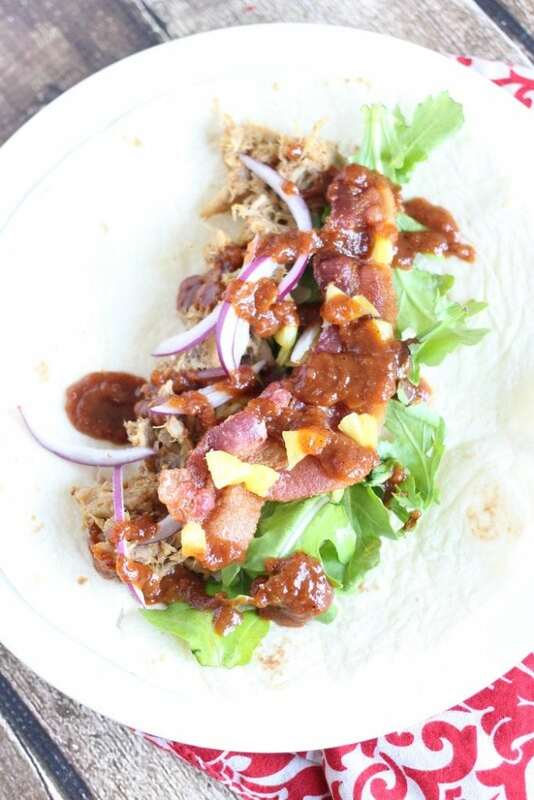 This Bacon Pineapple Pulled Pork Tacos recipe was originally published on 3/29/16 as a sponsored post written by me on behalf of Tyson Foods, Inc. The opinions and text are all mine. Mama Loves Food only works with brands we love! 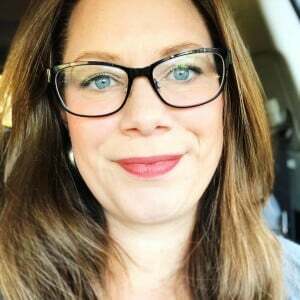 Thanks for sharing – you look great. Meat and pineapple has a good combination. I have eaten once at my friend’s home it was too tasty. I absolutely love Hawaiian Pizza so these tacos look like the perfect Mexican rendition of this favorite. 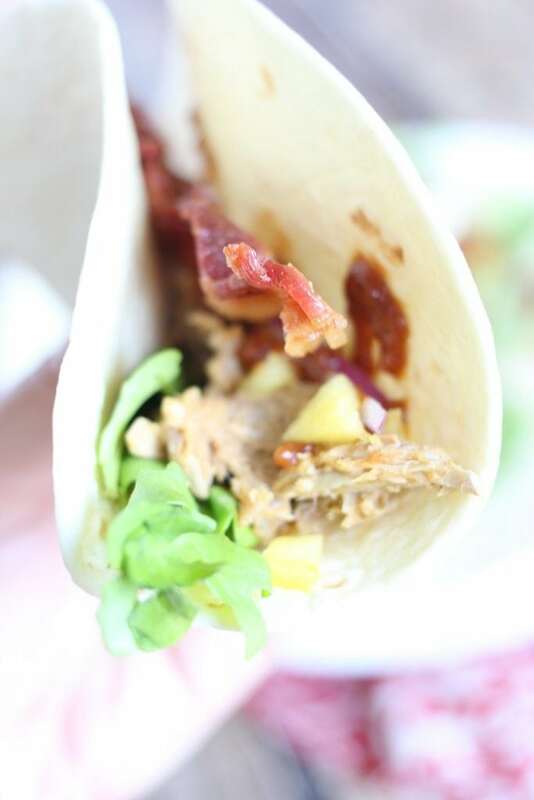 Of course, pineapple and pork always go so well together and who doesn’t love bacon?! Great idea for taco night which seems to happen quite often in our house. Most definitely going to make this soon. Those are some awesome looking tacos! I just love the combination of flavors!